Worked for Sir Alfred Watkin(1846-1914) Civil Engineer, director of several railways. • Marriage Witness/es: Louis Mills (His Brother) & Kate Mary Baldock (Her sister), 2 Jun 1909, Willesborough Parish Church, Ashford, Kent, England. 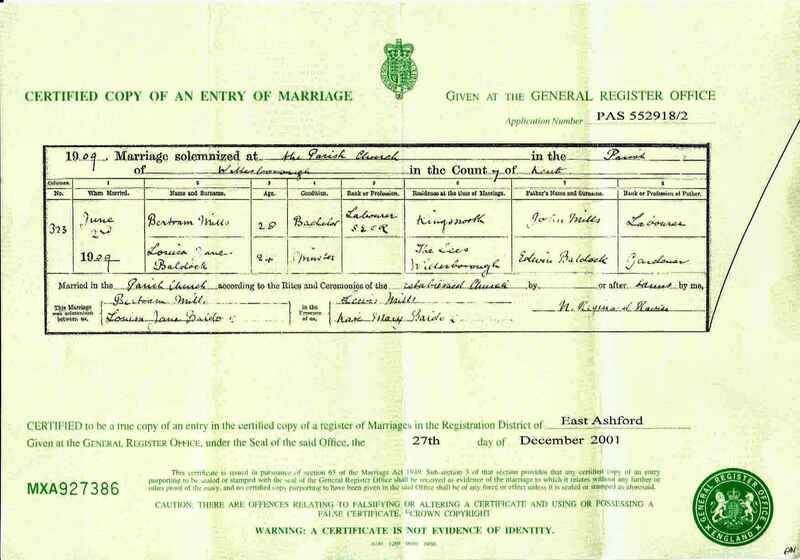 1 Marriage Certificate, Held by Graham Goldsmith. 3 Birth Certificate, born Dec Q 1884, Rye. vol 2b, page 5. 4 BVRI 2, From BVRI2, FHL Film 1468918. Also Batch No. C148365. 5 Death Certificate held by Graham & Sandy Goldsmith, Age 69, Ashford, vol 5b, page 15, Jan 1954. 6 Death Certificate held by Graham & Sandy Goldsmith. 8 1891 Census - 5/6 Apr 1891, RG12/757, fol.7, p.7. 9 1901 Census - 31 Mar/1 Apr 1901, RG13/777, fol.43, p.27. 10 Marriage Certificate, From her marriage Cert. 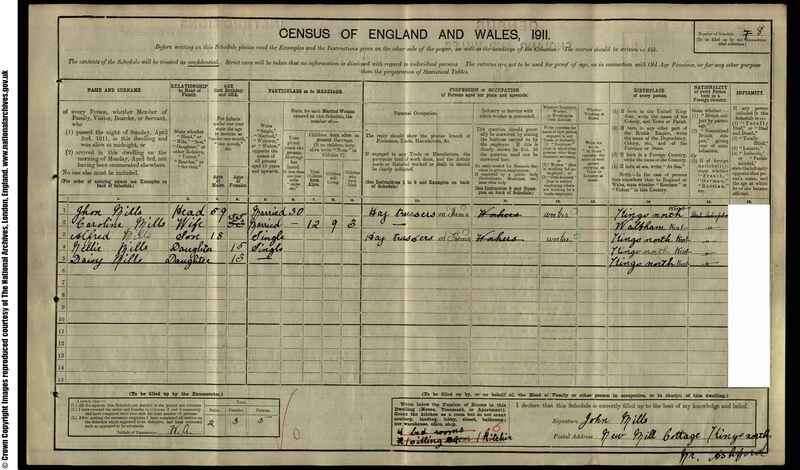 11 1911 census of England; digital images; citing RG 78, RG 14 PN PN170, registration district (RD) RD56, sub district (SD) SD1, enumeration district (ED) ED14, schedule number (SN) SN164. 12 Birth Certificate, Certificate held by G. Goldsmith. 13 Death Certificate held by Graham & Sandy Goldsmith, Dec Q 1966, Ashford, vol 5f, p.11.